Roose's Companion and Guide Map of Washington, and Vicinity. 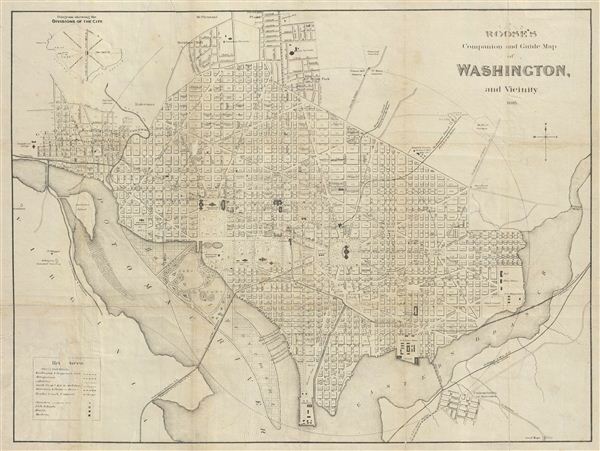 An uncommon map of Washington D.C. dating to 1885 by William Roose. Centered on the Capitol Building, this map covers from Georgetown to the Benning Road Bridge. The map offers a fascinating snapshot of the nation's capital at a time of rapid expansion and urban development. Shows the city in considerable detail with numerous important buildings including the Capitol, the Smithsonian Institution, the White House (not yet called the White House), the Washington Monument, the National Observatory, the Navel Yard, the Poor House, the City Hall, and others noted. The city's famous grid and ray structure appear according to L'enfant's brilliant plan. Georgetown appears as a separate entity in the upper left corner with Georgetown College noted just outside the city border. The projected Harbor improvement in the lower left – what is today the east Potomac Golf Course, is here ghosted in. This map first appeared in 1880 and was issued for Roose's guidebook Roose's Companion and Guide to Washington and Vicinity. The guidebook and this map were subsequently reissued several times throughout the 1880s – the present example being the 1885 edity. Roose, W., Roose's Companion and Guide to Washington and Vicinity, (Washington: Gibson Brothers) 1885. Good. Original fold lines visible. Professionally flattened and backed on archival Japanese tissue. A couple of minor repairs, see bottom left quadrant and intersection of Rhode Island Ave and Connecticut Ave.